OTTAWA - Cases of people swallowing button batteries reported to manufacturers and health officials that result in serious internal injury and death are on the rise. These small disc-shaped button batteries store lots of energy in a tiny space. They are commonly found in a wide range of products around the home that children have access to, such as remote controls, musical greeting cards, watches, calculators, flashing jewellery and shoes, key fobs, books, and other small electronic devices. The size, shape and energy storage properties of button batteries make them hazardous if swallowed. A swallowed button battery can block an airway or can cause serious internal chemical burns in the oesophagus in as little as two hours. The 20 to 25 mm diameter lithium button batteries result in the most serious injuries, especially where young children are involved. In cases of swallowing, the batteries were found loose on the floor by young children, in garbage bins, or on countertops, taken directly from a package, or removed from household products. Even adults, particularly seniors, have unintentionally confused button batteries with pills or food and been injured. 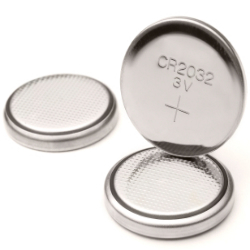 Due to the hazards they pose to young children and seniors, new or used button batteries should be stored in a location where they cannot be unintentionally found or swallowed. Children should not play with button batteries or remove the button batteries themselves. Only buy household products with secure battery compartments that cannot be easily opened by children. Make sure the button batteries in household products stay securely contained in the products. Supervise children when they use products containing button batteries, such as musical greeting cards, remote controls, books, flashing jewellery and other small electronic devices. Do not allow children to play with button batteries or remove them from household products. Store button batteries away from food and medicine, and out of reach of children. Scan floors, tables and counters for loose button batteries. Dispose of button batteries so that children cannot gain access to them. Take care when changing the button batteries in a product that they do not get mixed in with any pills, medicine or food. Realize that to anyone with poor eyesight, button batteries look just like pills or candy. If you think that a child or adult has swallowed a button battery, immediately seek medical attention. 20 and 25 mm lithium batteries can be identified by their imprint codes, CR2032, CR2025 or CR2016, which are located on the face of the battery. For further Information contact your nearest Health Canada Product Safety office by phone at 1-866-662-0666 (toll-free) or email at cps_spc@hc-sc.gc.ca (please indicate the province or territory from which you are corresponding).